Hello, I’m Greg Irwin. Over the past 30 years since the conception of Finger Fitness, I am constantly asked just what is Finger Fitness and why should I do it? Perhaps Walt Whitman put it best. It made sense to me that the better condition a machine or tool (i.e. the hand) is in, the better and longer it will perform its task. Especially as a musician, this need for improving the overall physical condition of my fingers and hands got me thinking about possible ways to limber and strengthen them to get them in the best condition to play my instrument. Little did I know it was going to lead into an entire fitness program and website dedicated to hand health. “Finger Fitness” actually started while I was working on my degree in Music Education at Miami University (Ohio). The music education program required that each student play and teach every instrument from the simplest to the most complex. The HAND with its physical strength, dexterity, and coordination capabilities to actual play the various instruments. The audio and mental skills, were taught and mastered in ear training and music theory classes. But, mastering the physical skills of playing an instrument was a different story. Very few of us could master that skill in the limited classroom time available. It meant that we all had to find a lot of time outside the classroom to practice and master playing each instrument. It also meant sore hands due to the lack of strength, coordination and dexterity required. Finding that additional time was a challenge. I found it similar to athletes trying to find the time to work out and practice in addition to attending classes, studying and of course playing their sport. After talking with many athletes I found that they spend an enormous amount time working out in order to strengthen and condition their bodies. Why? Because it allows them to play better, stronger and longer. For many, it even meant less stress on their bodies, fewer injuries and quicker recovery time from a lot of those injuries. I wondered why this conditioning approach was not used by musicians. After all, we are “small muscle athletes” who could use this athletic approach to improve our hands ability to physically play an instrument better and decrease pain and stress we often experience. Initially, I started doing simple splitting and bending exercises with my fingers and found that it did help me limber up my fingers and made it easier to play an instrument. As time went on I expanded on this idea. I added more exercises using the natural movements of our hand such as tapping and folding. To really challenge myself, I would do the exercises by isolating individual fingers, followed by combining different exercises and than having each hand do the opposite of the other. But after talking and demonstrating the exercises to hand surgeons, physical and occupational therapists, as well as sports medicine professionals, I found that, although there were rehabilitation programs for hands, there were none for advancing the ordinary hand to a higher level of strength and coordination. So with the help of my wife, Lorraine and Certified Hand Therapist Meg Robinson I organized the exercises and published the book and video “Finger Fitness: The Art of Finger Control” to introduce others to this unique approach to building finger coordination, dexterity and strength. 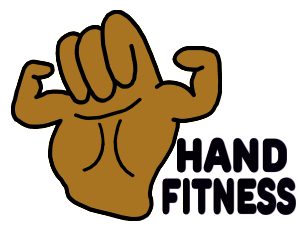 Our company, Hand Health Unlimited is an outgrowth of the Finger Fitness program. After publishing the book and first video introducing Finger Fitness in 1988, my wife and I started attending physical and occupational therapist conventions. We attended these conventions to not only create interest and obtain medical feedback on the Finger Fitness program, but more importantly, to find additional products and tools that complement our program. Over the last 22 years, our website, Handhealth.com continues to offer a variety of tools and products available for anyone looking to improve manual ability, help prevent hand stress and fatigue and rehabilitate many hand injuries. Products on our site include, additional DVDs on Finger Fitness and the products recommended by hand therapists. Over the last decade the number and types of visitors to our site has increased dramatically due to the ever increasing cases of Repetitive Motion Syndrome, Carpal Tunnel Syndrome, Tendonitis and Cumulative Trauma injuries. Visitors to our site include athletes, doctors, computer users, gamers, magicians, musicians, surgeons, teachers, therapists — basically anyone who is involved in hand-intensive activities. You will find more details about The Finger Fitness program and Hand Health tools and products on the drop downs above. We welcome your questions, comments and testimonials on both Finger Fitness program and HandHealth website so we can continue to improve and offer you – our customers the products YOU need.